At just about 300 million years old, horseshoe crabs are about 200 million years older than the dinosaurs. This almost mythical animal has survived mass extinction events that wiped out zillions of other creatures. The females can lay 90,000 eggs, which feed countless species of shorebirds and bolster whole ecosystems. Only 10 of those eggs survive. And, if you live in the U.S., the brilliantly blue blood of these animals has been used to test every vaccine you've ever had. 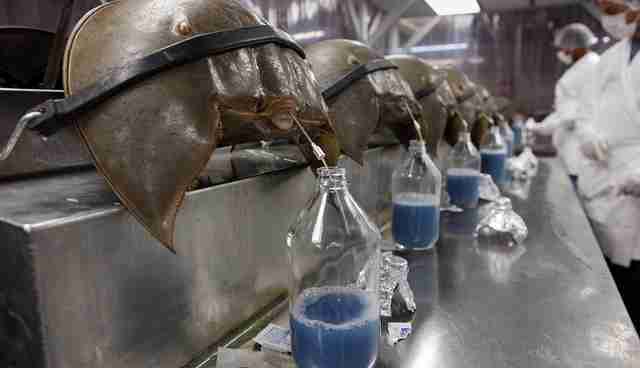 Half a million horseshoe crabs are caught and bled each year in laboratories linked to pharmaceutical companies. The animals are strapped in while their blood is extracted for 24 to 72 hours. Bottles fill up with their blood, a stunning shade of blue, which will be used to test vaccines for harmful bacteria. Then, they are released back into the ocean. And according to the drug companies, the process is much like a human giving blood - yet between 10 percent and 30 percent actually perish from the process. Even so, some might wonder, what's the problem, aside from the fact that the whole process sounds like the plot for a sci-fi film? "The only problem is that the companies need a large supply of the blood of live crabs," a 2014 article in The Atlantic noted. 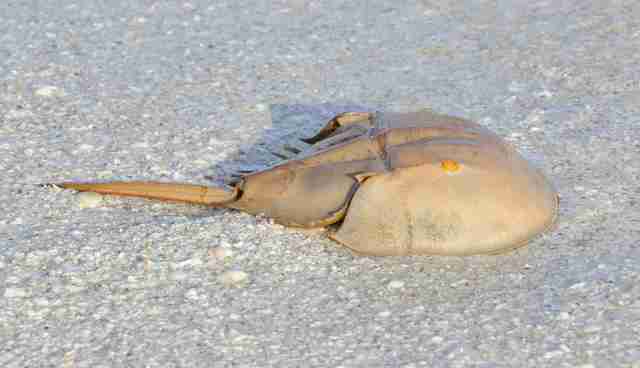 "Horseshoe crabs live on the seafloor, near the shore. When they want to mate, they swim into very shallow water, and horseshoe crab collectors wade along, snatching the crabs out of their habitat." The article also notes that there have been observations of female horseshoe crabs becoming less likely to produce offspring after being bled. And that could be causing populations to dwindle. According to the IUCN Red List, the horseshoe crab is already classified as a near-threatened species. And there's been an observed decline in the population of birds that feast on the eggs of the horseshoe crabs. Why isn't there an alternative? As with any question that pits animals used for biomedical safety against human survival, the issues become more and more complicated. But the short answer is that a variety of alternatives are in development. The danger is, however, that as soon as horseshoe crabs become less valuable to powerful companies, it's possible that people will care even less about their dwindling numbers, making overfishing and habitat destruction once again a threat to their survival. Sign a petition to help protect horseshoe crabs here.